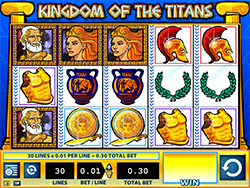 The classic Grecian tale of the Titan Gods comes to life in the 5-reel 30-payline video slot Kingdom of the Titans slot machine from WMS slots! The classic Grecian tale of the Titan Gods comes to life in the 5-reel 30-payline video slot Kingdom of the Titans slot machine from WMS slots! There were twelve Titans in classical Greek mythology which included such famous Gods as Atlas, Oceanus, Theia and Prometheus. They were a powerful generation of deity that ruled the cosmos before the Olympian Gods came to power. Now you can harness their strength and translate it into powerful spins with potential for great wins in this terrific game. The game is really very simple looking which gives an idea of how long it’s been online. In fact, it was released in 2011 which speaks to the longevity of the game as a favorite among many slots players. The game has a strong blue and gold color scheme with Greek ionic columns going up each side of the casing. On the reels you’ll find symbols like a male and female God, a warrior’s helmet, a gold shield and dagger, the game’s logo (wild symbol), a mountain (feature trigger), a laurel wreath, a suit of armour, a silver coin, a harp and a vase. Logo Wilds – The game’s logo is the wild in this game and will substitute for all symbols except the Feature symbol. The Wild will only show on reels 1, 3 and 5. Mountain Free Spins – The Mountain of Olympus is the Free spins scatter symbol and you’ll need to get 5 or more of them on anywhere on the reels to trigger free Spins. In fact, the more mountains you land, the more free spins you win. Getting 5-7 symbols gives you 8 free spins; 8-9 wins you 10 free spins; 10 scatters wins you 25 free spins; 11-15 scatters gets you a considerable 50 free spins! Also, you can activate the Spinning Streak feature during Free Spins which will get you a further 10x multiplier on all wins!